We’ve received a tip about an unexpected application for the NFC chip Apple is expected to build into the iPhone 5. Near Field Communication (NFC) is a short-range wireless connection technology that would turn the iPhone into an electronic wallet or security passkey. NFC is already in use in Asia and is expected to explode here in the next three to five years, especially if Apple adopts the technology. 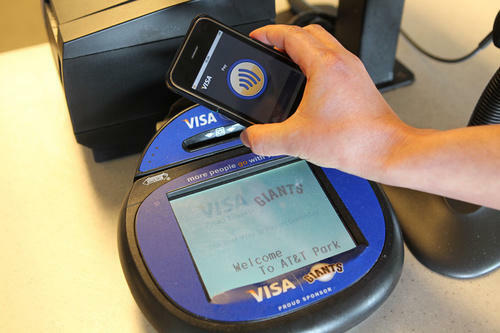 NFC has been rumored for the iPhone 5, and Apple appears to be gearing up for a NFC revolution. It has made a lot of NFC hires, including a a leading NFC expert and has patented a lot of NFC technology. If the iPhone 5 does have NFC, applications like an eWallet are a no-brainer. But we’ve been told that Apple is also researching NFC for remote computing. For example, a NFC iPhone will allow users to carry a lot of their desktop data and settings with them — and load that data onto a compatible Mac. Our source continued: “Address book would show their contacts, and the user would have full access to their information in the same manner they would if they were working from home. This same behavior extends to even showing the same desktop picture, mouse and keyboard settings, and would eventually extend to software licenses and passwords for websites such as Facebook. “When a person walks away with their iPhone and away from the communication link with the Mac, the original settings of the Mac would be restored. All communications and storage of passwords stays on the user’s iPhone, leaving nothing stored on the computer. If true, it raises some interesting possibilities. To do this, Apple may have to add online elements to OS X and its applications. Apple obviously is moving into mobile big time with iOS, but there are some indications that OS X Lion, due next summer, will also have cloud elements. At the recent demo of OS X Lion, for example, Apple said applications will auto save and auto resume — rather like Google docs. The new MacBook Air looks like a cloud machine, and there’s that massive data center on the east coast. Apple has been looking at building NFC into the Apple TV, and other PC makers are already building NFC into their machines. Lenovo is offering a NFC as an option on some ThinkPad laptops for secure log-in and online banking using contactless smartcards. Our source says Apple has always been looking for a way for a user to carry their home folder with them, but with ballooning iTunes and iPhoto libraries, it’s become a challenge. “I don’t know if this information will be stored on the cloud or not, but I do know that smaller bits such as preference files, system settings, documents, keychain passwords, and other items would be stored on the iPhone for fast retrieval,” they said. Analyst Sarah Clark of SJB Research, who is also editor of Near Field Communications World, said the key advantage of NFC is that it’s a quick and easy authentication system. “It makes it very easy to connect two devices together so that information can be transferred between them – much easier than Bluetooth, for instance,” she said. However, she said the data transfer rate isn’t very fast. Our source also cautioned that the technology may never see the light of day. Although Apple has been working on the system for some time, there’s a chance it will never be released.